Please read the terms and conditions for each bonus carefully. 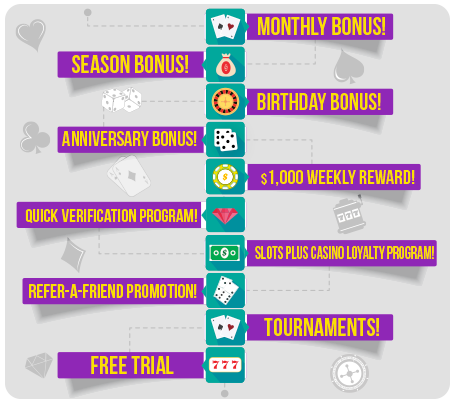 In addition, each of our bonuses and promotions are subject to Slots Plus General Rules and Regulations (Bonuses terms and conditions). The cashier is located inside the casino app. FROM MONDAY TO SUNDAY YOU CAN CHOOSE FROM ONE TO ALL OF OUR AMAZING PROMOTIONS... WE OFFER ONE DIFFERENT FOR EACH DAY!!! IMPORTANT: Any individual or groups of individuals attempting to defraud the casino or engaging in any type of syndicate betting will forfeit their deposits, bonuses and winnings. This includes, but is not limited to, opening multiple accounts in an attempt to claim the initial deposit bonus multiple times. Have a question you need answered? Contact us anytime!.